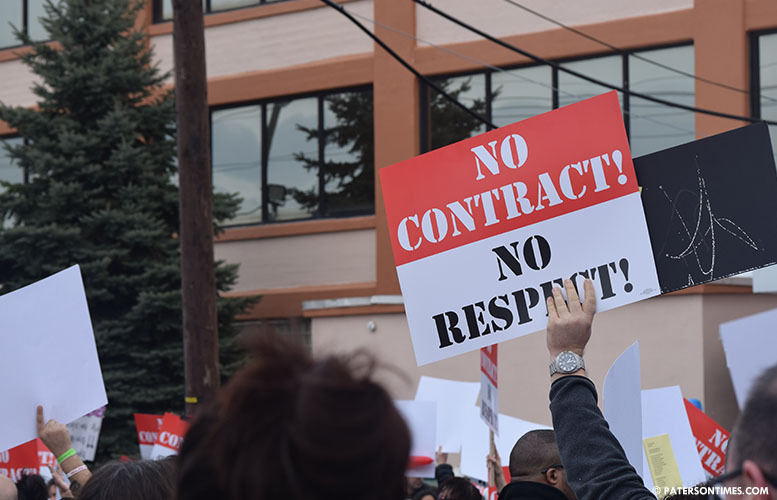 The school district and the teachers’ union have reached a tentative agreement following a 19-hour negotiation session, announced both the Paterson Public Schools and the Paterson Education Association on Thursday afternoon. Details of the tentative agreement have yet to be made public. A “blackout” on the specific content of the accord was imposed by the mediator, according to the district. Both sides celebrated the breakthrough. The school board and union members have to vote on ratifying the contract. The teachers in the rally demanded a new contract. Their last contract expired in June 2017. The previous contract took four years to reach. “Ensuring that our teachers have a contract is an essential part of our School Board’s ongoing quest to have local control returned to our district. This Board remains committed to our children and their future success – and that begins with our educational staff,” said school board president Oshin Castillo. Unlike in previous contract negotiations, school board members played a role in hammering out the new contract. Castillo was part of the negotiations while school board members Flavio Rivera and Manny Martinez were on stand-by. Both sides spent the entire night at the district office working out a deal. Some union officials began sharing the news that a deal had been reached early Thursday afternoon. The teachers’ union has more than 3,000 members. “Our negotiating team is looking forward to releasing the details of this agreement once the ratification vote is scheduled by both parties,” said McEntee. Good about time P aterson values educators .